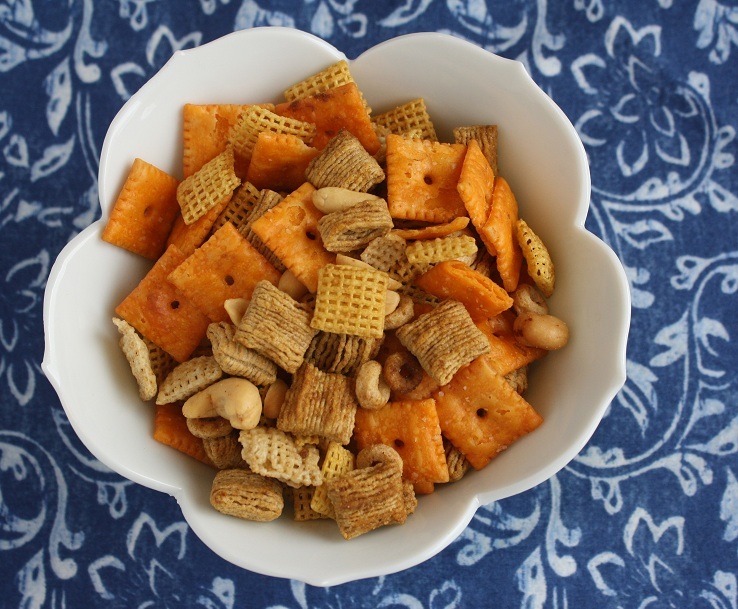 Whenever I'd visit my Grandma in Lake Geneva, Wisconsin, she'd quickly put out "nibbles" for us to snack on. Often it was crackers and Merkts Cheese Spread, which was yummy (to our family's delight, it's now being sold in Rochester at Tops Friendly Markets). But even better was her party mix. And, like so many other things she made, her mix was better than anyone else's. I often got my Mom's evil eye for eating more mix from the bowl than was polite. 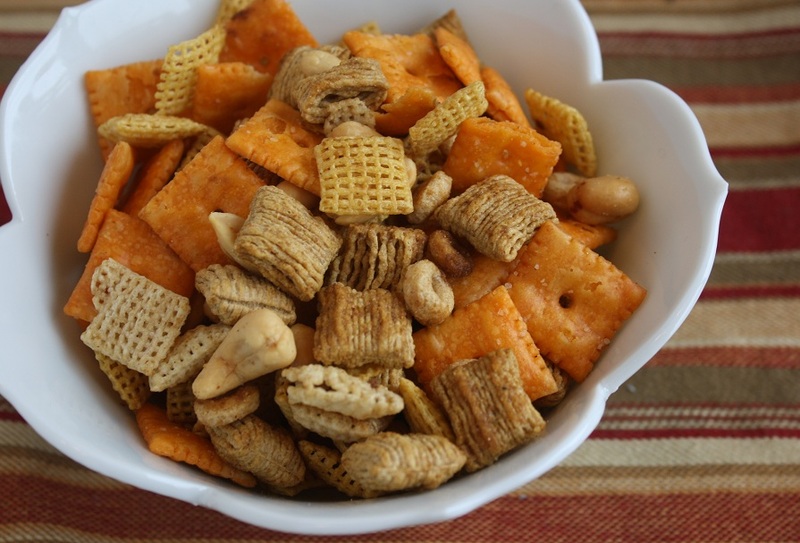 When I was making my goodies for Christmas, I thought I'd make a batch or two of her mix, but a search through her old recipe box turned up only The Original Chex Party Mix. That's good stuff, but Grandma's always had a square of something that tasted the best. Luckily, my cousin Erin immediately knew the secret ingredient: Quaker Oatmeal Squares in the blue box. In fact, Erin said Grandma used to make her batches of just Oatmeal Squares and the coating. Sure enough, Erin was right on the money. They add a slightly sweet flavor and a great texture to the mix. Heat oven to 250°F. In ungreased large roasting pan, melt butter in oven. Stir in seasonings. Dump in the crunchy stuff and stir it until it's evenly coated. Bake 1 hour, stirring every 15 minutes. Spread on paper towels to cool, about 15 minutes. Store in airtight container. I like the idea of Cheetos in them as it is one of my favorite snacks. We are seriously considering a Merkts intervention for my husband. I think he just might bleed orange if cut. I personally love a bowl of Chex Mix. Yum. Sounds yummy. You'll be in trouble if Quaker Oats ever changes the packaging. What if they use a blue box for something nasty? Be careful. Barbara, I think that would be great but I think I'd put the Cheetos in after they were done baking. Karen, Merkts is the best, isn't it? I just made another batch of Chex Mix. Try it with the Quaker Oatmeal Squares next time! Sue, we would be screwed if they changed the packaging. To us it has always been the Quaker Oatmeal Squares "in the blue box." ooo I like this use-up-the-box version! Nothing like using what you already have in the cupboards. I love this -- reminds me of my childhood. Haven't had this in years! I like your combination -- especially the addition of oat squares!